How do we move forward in tough economic times in a way that respects the planet and ensures a fair, living wage for local workers? This was the topic of a 'breakfast speakers series' held at Melrose United Church this past Saturday. The speaker was Environment Hamilton's executive director, Dr. Lynda Lukasik. Lukasik believes that a focus on greening our local economy provides a viable solution to economic re-envisioning for the future. The project was launched last month and interested people are invited to join the discussion. The Green Sacred Space Awards were developed in 2006-07 by the Ottawa Steering Committee of Faith & the Common Good under the leadership of John Dorner. We thank the Ecology and Theology Working Group of the Anglican Diocese of Ottawa whose earlier work helped us establish the frame of reference and criteria for the awards. The GSS award is an affirmation of the commitment to environmental stewardship as shown by a given faith community through five actions in each of three areas: spirituality and worship; sacred space activities that promote a healthy environment; and outreach to the wider community in support of environmental action. St James has had a walkthrough audit, they have held 2 eat local feasts, they have bought a bike rack, they offer regular recycling/composing/green bin use education to the community at large. They are part of the newly formed Eco-Churches of West Hamilton and they are heavily involved with climate change action (350, Copenhagen). The have helped develop a green cleaning products guide that FCG have adapted. Laidlaw Memorial United Church. This church has been greening their sacred space for over 5 years now with significant results. They are actively seeking to install solar panels this year and generate green energy that they will also use to feed into the grid. They will be offering a tour or the church this month as well as hosting the Greening Sacred Spaces Solar Conference in April. There will be five practical workshops to equip you for the task ahead, and an interfaith panel including Mardi Tindal to inspire and encourage you. Greening Sacred Spaces will be introducing their new solar energy program for religious buildings, and making their annual awards for the Hamilton, Kitchener-Waterloo and Toronto areas during a shared meal. Mardi Tindal will also be the preacher at Eastminster's morning service. local workers? Environment Hamilton believes that a focus on greening our local economy provides a viable solution. Rev. Doug Moore's Laidlaw Memorial United Church congregation is praying for sunshine. The Ottawa Street North church is one of the first in Ontario to apply to sell electricity generated by rooftop solar panels. Its application went in as soon as the province's MicroFIT renewable energy incentive program launched in October. Now Moore's trying to persuade the Hamilton Conference of the United Church to loan him the money needed to replace a leaky roof and install the power panels. An initial 10-kilowatt system could bring in nearly $10,000 a year. Moore says Laidlaw is built like a Masonic hall, on an east-west axis, so the south-facing, sloping roof supported by riveted steel beams is perfect for a solar installation. "They drool," he says, "all the solar people drool. We've had three of them come around." But he wants to own the system, "so all the money isn't sucked out of this community. Whatever comes off this roof is going right back into east Hamilton." They aren't big spenders down on Ottawa North. 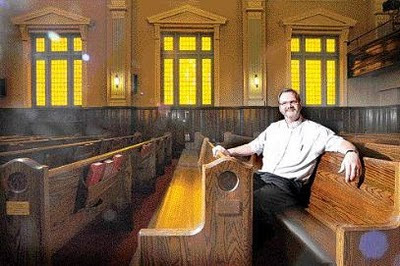 Moore and the church council run the place on a $115,000 annual budget that includes his full-time salary. Frugal is the word he uses. They rent their parking lot to the funeral home next door and run bingo games and penny sales to raise money. Compact fluorescent bulbs just in the sanctuary cut the hydro bill $30 a month. New thermostats save more. In years past, when the church decided to install air conditioning, it went in the attic, because cool air drops naturally. It costs just $50 a month to run. A gas shut-off valve saves the $250 a month it once cost to run five pilot lights on a big kitchen stove. "The whole green thing is not new to this congregation," says Moore. Despite their thrift, the need for a new roof is a crisis, one Moore hopes to turn into an opportunity with the solar project. The idea was born at last summer's Winona Peach Festival where Dan Cole of Brantford had a booth promoting Power for Faith and Healing, his effort to bring churches and nonprofit groups together to share information and form a buying pool to get a discount on solar panels. Says Moore, "I need $85,000 to fix the roof and I can't get that out of the 80 people here on Sunday morning." With a loan, he figures he can afford to install panels with a capacity of 10 kW, just enough to pay for the project over 20 years, but there's room for another 20 kW he dreams of adding. He invites other churches to work with Cole, "because if we all come together, the price will come down." And he has recruited a project manager to prepare a business case for the loan, saying some in the United Church worry about investing in buildings they might have to close because of dwindling attendance. Moore says, "If we flop, we'll have a church everybody will want to buy, making $10,000 a year from the parking lot and $10,000 from the roof." Laidlaw's office number is 905-544-6536. For more on Cole's venture, go to directcurrent.ca.